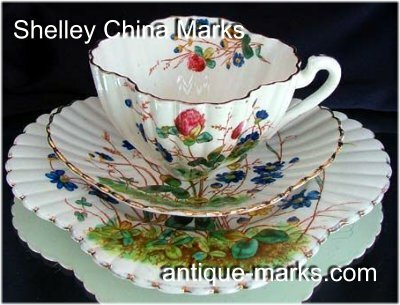 Shelley China was adopted as a trademark in 1910 by Percy Shelley. However the Shelley potteries history starts about 100 years earlier than that. In 1827 John Smith built a group of potteries that became known as the Foley Potteries. The Foley factory was let to a partnership which included John King Knight who eventually became the sole owner in 1847. In 1853, Knight was joined by Henry Wileman. Just three years later, in 1856-7, John King Knight retired and Henry Wileman was left in charge. When Henry Wileman died, his two sons (James and Charles Wileman) took control of the Foley pottery. In 1870 James Wileman took full control. In 1872 James Wileman recruited Joseph Ball Shelley to work with him. The intention was to develop the Foley China side of the Wileman business, with an emphasis on developing export markets. The industrial revolution meant that transport and international trade was now much easier than ever and Wileman and Shelley were quick to understand the opportunity this presented. From then on the Foley pottery really started to grow and prosper and the Foley company registered the trademark name of Wileman & Co. In 1881, Percy Shelley joined the company and when James Wileman retired in 1884, the Shelley’s were left in charge. In 1893 Percy Shelley visited the Chicago Exhibition and thereafter the Foley China company began producing designs for sale in North America and Canada. Under Percy Shelley, the late 19th Century was a creative time for Wileman & Co.
Frederick Rhead was recruited in 1896. He was appointed Art Director and produced some of the most innovative and creative work that ever came out of the Foley Works. Frederick Rhead is most famous for the Intarsio and Urbato ranges, but he also contributed to many of the patterns used for Shelley table wares of the same period. In that same year Rowland Morris sold his designs to Percy Shelley, including the very popular Dainty White shape, which became Shelley’s longest running design. Dainty White was popular from its introduction in 1896 right up to the close of the works in 1966. But, 1900 to 1910 was a tough time economically. The pressure of two recessions and the rise of cheap imports meant Percy Shelley had to focus on commercially safe products. Walter Slater was recruited to replace Rhead. He came from a strong and fairly traditional potteries background and proved an ideal replacement. He helped guide Shelley through some difficult times. Walter Slater left his own legacy of creative work and today, signed Walter Slater designs are popular with collectors, commanding good prices. In 1910, the Shelley China mark was officially adopted by Shelley. The pottery made steady progress through the second decade of the 20th century, despite WW1. After WW1, the Shelley family involvement in the company expanded to include three of Percy Shelley’s sons. Throughout the 1920’s and 30’s Shelley managed steady growth and relatively good success, both at home and in export markets. Much of this success is put down to hard work and clever marketing. Shelley, advertised and marketed its product range extensively, to both trade and the public, and this encouraged retailers to stock Shelley China wares. New Shelley ranges were introduced in the 1920’s & 30s including the nursery ware range, featuring designs by Mabel Lucie Attwell, and the stylish Harmony ware ranges. These designs proved very popular and are still highly collectable today. Her designs featured the popular chubby children, supposedly inspired by her daughter Peggy. 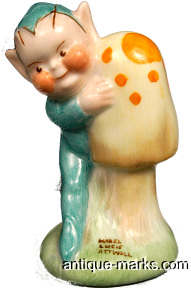 Other designs featured the Boo Boo elf characters. Today a Shelley ‘Boo Boo‘ elf tea set in good condition, with Attwell facsimile signature and Shelley marks, can fetch from £400 to £600 GBP. The saluting ‘Boo Boo’ elf milk jug on its own, could fetch up to £150 GBP. Mabel Lucie Attwell’s designs were produced well into the 1930’s and good examples are highly sought after and very popular with today’s Shelley collectors. Look for pieces bearing her facsimile signature and the green shield Shelley mark. There are fakes about and collectors should beware of pieces that are all hand painted or have overglaze tranfer prints. The Shelley marks have also been faked and should be checked carefully. Avoid Simpsons Pottery Ambassador Ware pieces, as although they feature Mabel Lucie Attwell designs they are not Shelley china. Similarly Mabel Lucie Attwell never worked for or produced designs for Susie Cooper, so beware of Susie Cooper designs that mimic Attwells. The Shelley, Mabel Lucie Attwell pattern book was lost when the Company was taken over by ABP. In 1949, during a Royal visit to Stoke-on-Trent, Princess Elizabeth was presented with a set of Mabel Lucie Attwell nursery china for Prince Charles. The 1930’s Shelley Harmony range of Art Deco style tea wares are also highly collectible. The Harmony range epitomises Art Deco style and some pieces are very similar to Clarice Cliff designs. The Mode shape designed by Eric Slater was produced from 1930 to 1933 and is probably Shelley’s most sought after Art Deco styled piece. A Mode shape teapot with original cover and the correct marks could sell for £300 to £400 GBP. The Eve and Vogue shapes are also very popular and discovering a good quality Yellow Butterfly or an Apples pattern tea set could increase your bank balance by up to £2500 GBP. Purple coloured Harmony designs are also very rare, and command good prices. 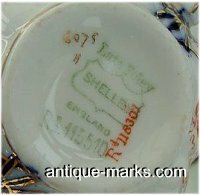 In the late 1930’s and early 40’s the second world war left Shelley China relatively untouched, due to their very strong exports. Shelley were allowed to continue producing decorative ceramic wares for export, in order to bring in much needed foreign exchange. It was only after World War Two ended that the problems started at Shelley. Shelley designs became less innovate and inspired throughout the 1950’s. They appeared dated and old compared to the modern vibrant products from potteries such as Poole and Midwinter. The introduction of new Shelley designs also seemed very few and very far between. 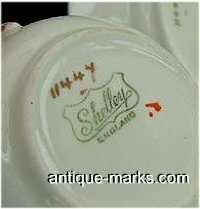 So, in 1966 Shelley’s end came about through a buyout of Shelley China by Allied British Potteries. ABP invested heavily and re-equipped the Shelley China works to produce the ever popular Royal Albert range of porcelain. Popular Shelley cup shapes include Gainsborough, Vincent, Richmond, Henley and Dainty. A design called Sheraton was produced for export to Canada, it features pattern numbers 13289 Maroon, 13290 Green and 13291 Blue. Shelley stopped production of earthenware in the 1930’s and concentrated entirely on producing fine bone china. Thereafter, Shelley produced four main types of ware, each with its own pattern book. They included: Best Ware, Ideal China Ware, Seconds Ware and Special Patterns Ware. Best Ware, is the best quality ware. Pattern numbers start with 13000, dated 1939. Continuing to 14341, dated May 18, 1966. Ideal China Ware, (also known as Canadian Teaware), pattern numbers start with ‘0’. 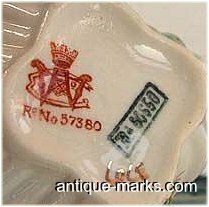 First number was 051, dated February 1938, continuing to 0721, dated May 1966.Collectible Pattern number 051/28 is the Dainty Blue pattern on the Dainty shape. 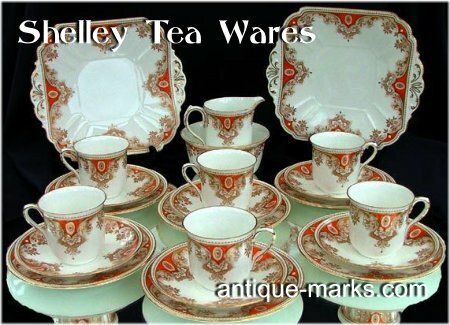 Seconds Ware, are Shelley items that have a fault in the glaze or the actual china.The seconds ware pattern book starts in 1919. Pattern numbers range from 2000, dated June 1919, to 2751 dated June 1966. Special Patterns Ware, is the hardest to find.Pattern numbers relate to special requests from retailers, they start at 1 and continue to 988, which is dated May 1966.The items produced in each pattern can be as low as 50 to 100 pieces. For instance, 1930’s cafes bought the Mode and Eve shapes with their cafe crest or emblem on the items. Popular pre-WW11 Shelley shapes include Gainsborough, Henley, Richmond, Ripon, Regent, Oleander and the ever popular Dainty shape. Shelley introduced new cup shapes in the 1950s, including Cambridge, Ludlow, Boston, Lincoln, Stirling, Stratford and Warwick. Two miniature shapes, Westminster and Cathedral were introduced in 1956. The Avon cup shape was added in January 1964. Wild Flower pattern no. 13668 and Lyric pattern no. 13778. Chintz patterns Rock Garden, Primrose Chintz, Summer Glory, Melody and Maytime. Abstract patterns were introduced in the 1960’s including; Cleopatra, Aegean and Apollo, but they had little market impact.